The Ireland-U.S. Council was formed in 1962 by a group of American and Irish business executives led by John D.J. Moore, who later served as U.S. Ambassador to Ireland. 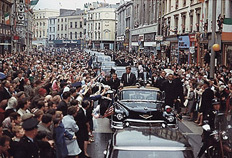 A key purpose of the Council’s founding was to prepare for the first-ever State Visit of a sitting U.S. President to Ireland by President John F. Kennedy on four magic days from June 26-29 in 1963. The Ireland-U.S. Council was founded as a measure to build institutional form around a structure to improve the economic, business and commercial relations between America and Ireland. At that time, two organizations were created. One was dedicated to cultural relations (The American Irish Foundation now part of The American Ireland Fund). The other was The Ireland-U.S. Council which was and is dedicated to building business bonds and commercial connections between the two countries. In those early years, Ireland was not a member of the European Union. Thus, many of the Council's initiatives during the 1960's and early 1970's involved the bilateral relationship between the United States and Ireland in economic, business and commercial matters. The Council's officers and representatives in those days were heavily involved in cases before the Federal Trade Commission, committees of the U.S. Congress, the Federal Aviation Administration and other Government agencies. Since Ireland became a full member of the European Union in 1973, the character and nature of the relationship between the two countries changed quite dramatically. The strict bilateralism of the earlier decade was replaced, on many issues, by Ireland's interests being served in some ways in the context of the broader European Union nexus with the United States. There are many important arenas in which the relations between the Emerald Isle and the United States continue to attract the Council's involvement. These range from bilateral taxation treaties to aviation policies and to certain immigration matters. In pursuit of its aim, the Council hosts frequent events in Ireland and in the United States. The Council also operates a variety of scholarship and student internship programs, stages occasional seminars and conferences. From time to time, The Ireland-U.S. Council also undertakes publishing and promotional initiatives in national business media in the United States to promote closer economic relations between Ireland and America. The Council seeks also to focus on activities that will develop communications, dialogue, information flow and improved understanding between leaders in business and government on both sides of the Atlantic. The Council has no partisan political affiliations in Ireland or in the United States. However, the organization is not non-aligned. The Ireland-U.S. Council is firmly aligned with a mission to encourage economic conditions where businesses can grow and expand on both sides of the Atlantic. We believe that an enhanced investment environment in Ireland and in the United States will lead to improved circumstances and higher living standards for people in Ireland and in America. The Council strongly supports Government policies aimed at expanding investment, trade, commerce and tourism between our two countries. We believe that smaller and less Government, with fewer rules, regulations and red tape, tends to encourage business expansion. We share the view that fewer and lower taxes on businesses and individuals will promote economic growth. We believe the converse also to be true. As we seek to strengthen the ties that bind us, the Council is pleased to note that the state of economic relations between Ireland and America has never been stronger or deeper or more durable. If you would like to assist in this mission by joining the Council, we welcome new members.